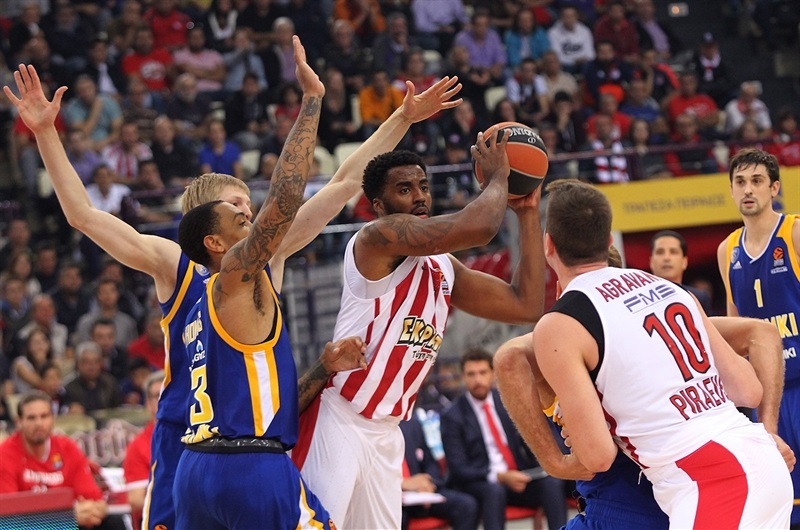 In a battle to stay undefeated, Olympiacos Piraeus bested Khimki Moscow Region 92-75 at Peace and Friendship Stadium on Thursday. 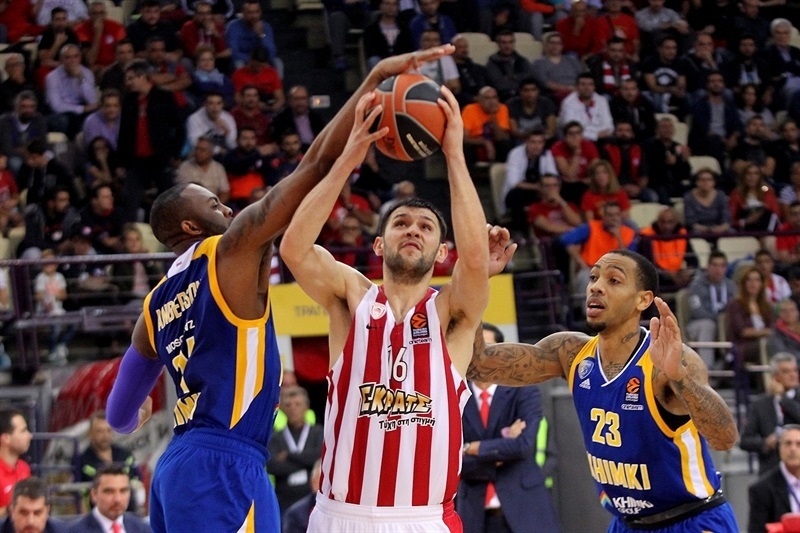 Olympiacos improved to 4-0 in the standings, while Khimki dropped to 3-1. Nikola Milutinov led the winners with 17 points on 8-of-8 two-point shooting, Georgios Printezis added 15 points, Hollis Thompson scored 12 and Janis Strelnieks had 10. 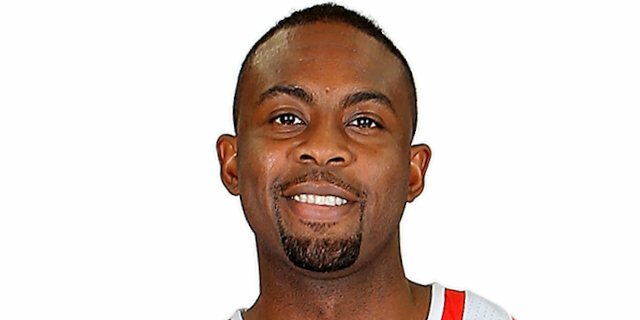 Alexey Shved led Khimki with 23 points, Thomas Robinson added 19 and 11 rebounds and James Anderson had 13 points in defeat. The Reds led 22-20 after 10 minutes, but an outstanding Robinson helped Khimki take the lead, 27-30. 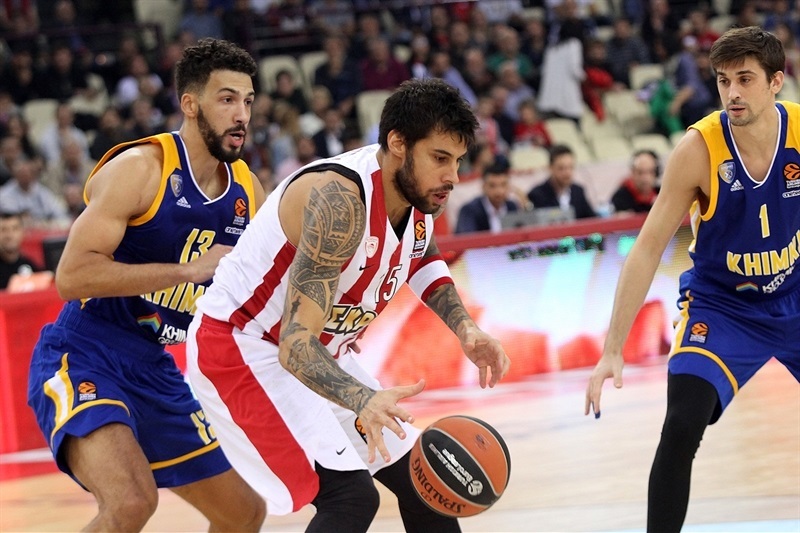 Vangelis Mantzaris and Thompson fueled a 15-2 run that put Olympiacos ahead for good, 42-32. 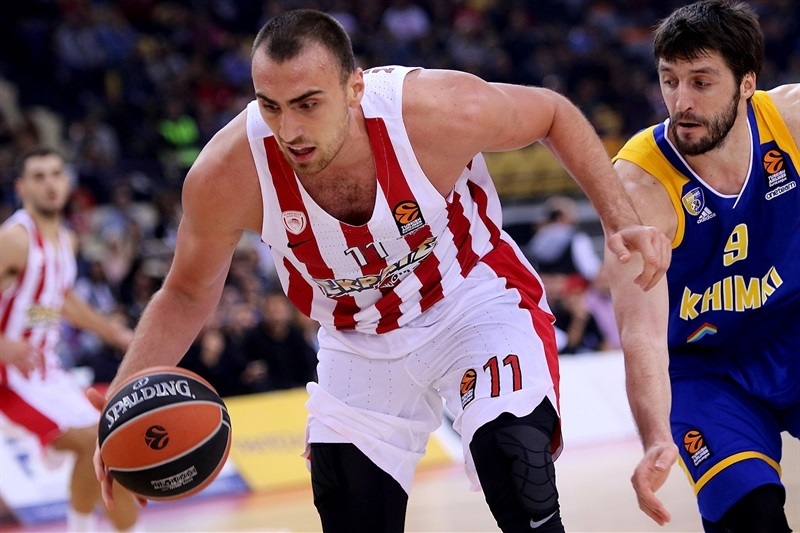 Milutinov and Printezis combined for 14 points in the third quarter as Olympiacos boosted its margin to 74-55 after 30 minutes and cruised to victory. 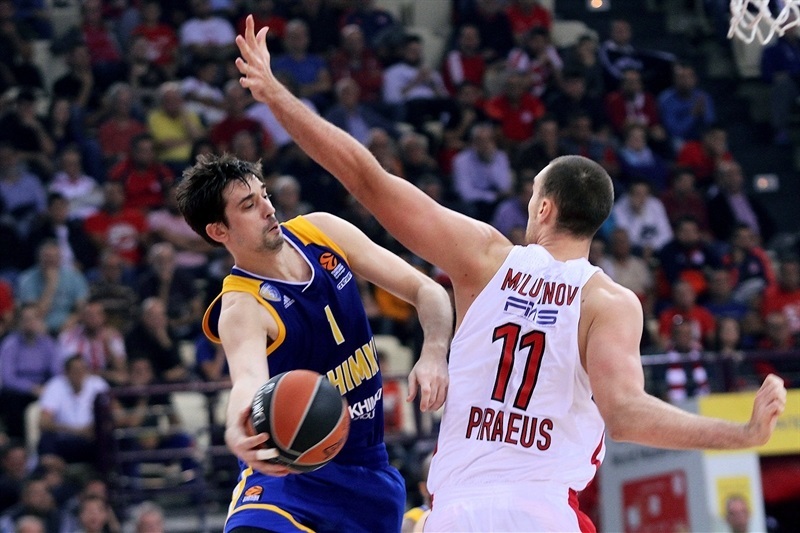 Back-to-back jump hooks by Printezis and Milutinov got Olympiacos going. 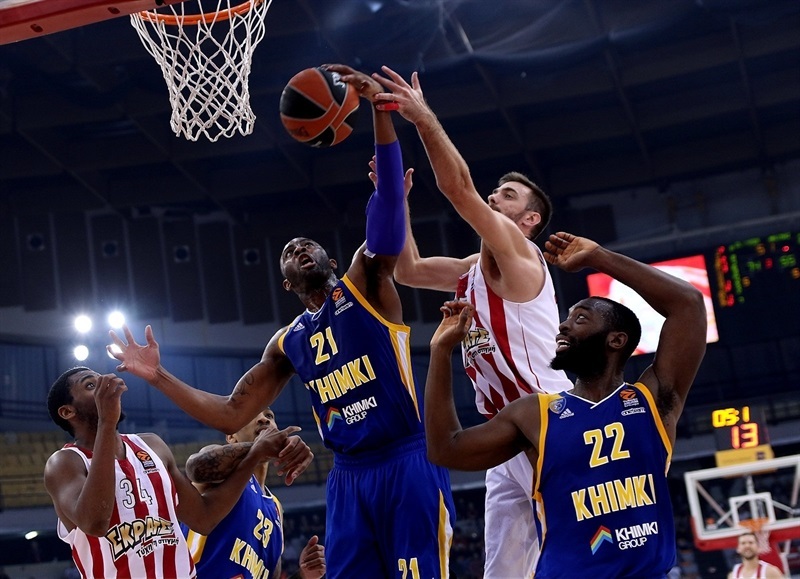 Anderson hit a floater, but a red-hot Milutinov had 4 points in a 6-0 run that gave Olympiacos a 10-2 lead. 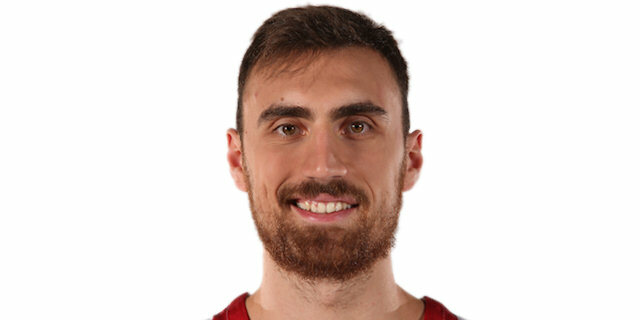 Shved struck twice from downtown and got help from Anderson and Robinson to tie it at 13-13. Ioannis Papapetrou had 5 points in a 7-0 run that he capped with a coast-to-coast layup-plus-foul. Shved and Robinson kept pushing Khimki and a layup by Sergey Monia got the visitors within 22-20 after 10 minutes. 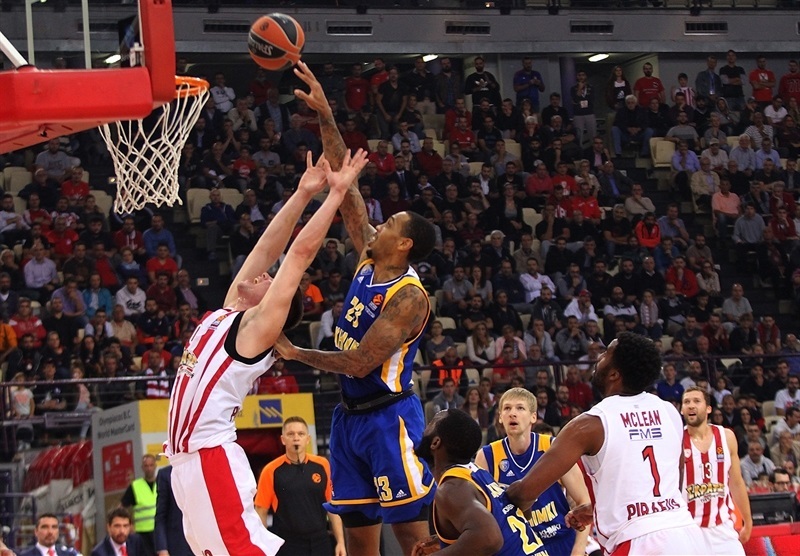 Strelnieks hit a triple and Dimitris Agravanis added a driving layup, but an outstanding Robinson singlehandedly gave Khimki its first lead, 27-30, early in the second quarter. A three-pointer by Mantzaris and back-to-back baskets by Thompson sparked a 15-2 run highlighted by Milutinov's big basket in the low post. Strelnieks sank another triple to make it an 11-point game. Charles Jenkins took over with an alley-oop slam and Anthony Gill added a huge dunk to bring Khimki a bit closer, 49-40, at halftime. 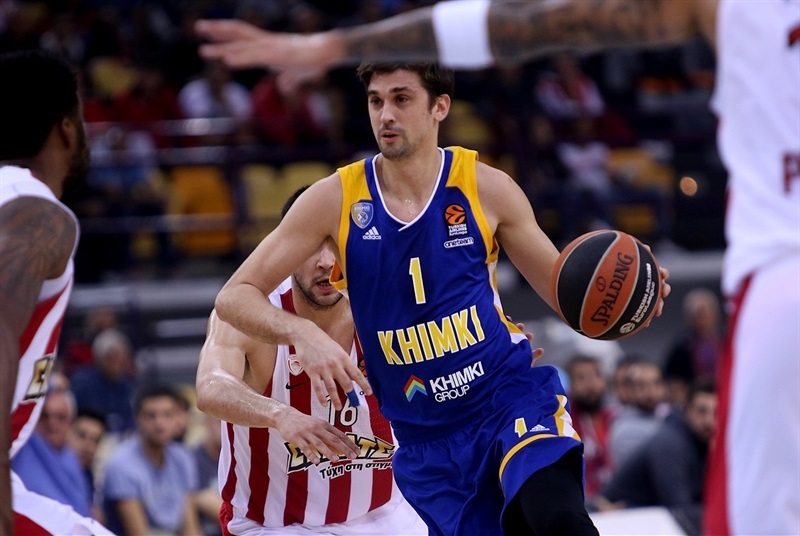 Gill sank a triple right after the break, but Olympiacos stepped up on defense and found a go-to guy in Milutinov, who followed an alley-oop layup with a turnaround jumper for a 55-45 lead. Milutinov's put-back slam ignited a 10-0 run which he capped with a jumper to break the game open at 65-47. Anderson scored three times around the basket, but Thompson and an outstanding Printezis boosted the hosts' margin to 74-55 after 30 minutes. 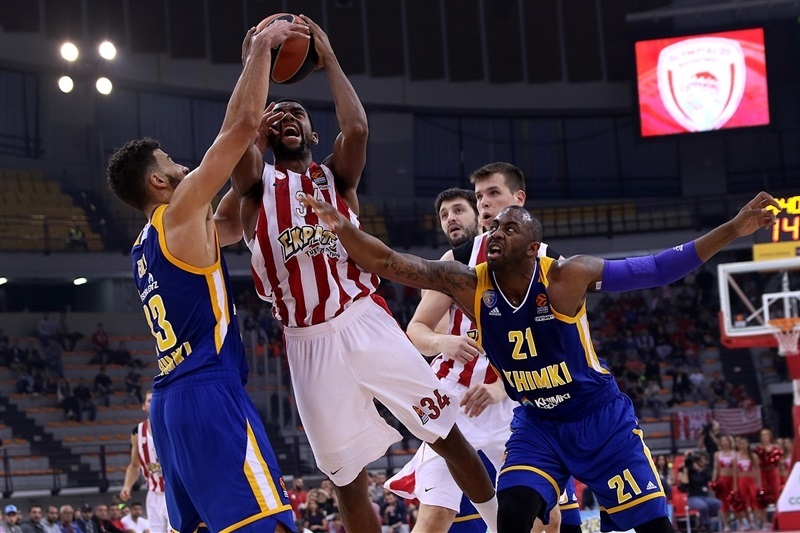 Olympiacos started to use longer possessions in the fourth quarter and a jumper by Thompson and a free throw by Strelnieks sealed the outcome, 83-62, long before the final buzzer. "It is a very important win against a very talented team, against a team that is great on offense. I think that, in some moments of the first half, we were very good. We got a double-digit lead twice in the first half, but Khimki managed to come back both times. At halftime, we discussed with the players and said we had to be more aggressive on defense, not to give up some easy points in certain parts, as we did it in the second part of the first half. It happened, but I think that, in the third period we showed all of our quality, defensively and offensively. We played great defense, they scored only 15 points and we had the chance to run in the open court and score fast break and transition points. That gave us a bigger lead. After that, we controlled the tempo of the game in the fourth period and continued to be focused on both ends of the court. In the end, we got an easy win. It is just a win and I asked already to all my players in the locker room to forget this win because it is too early to celebrate. We need to stay humble and continue to work hard, to improve our game, because it is just the beginning of the season and I strongly believe we have a lot of potential - we can play much better. Last but not least, I want to congratulate and thank all the fans that came here tonight and supported us. We want our fans to be together with us because all together, we can do great things." "It was a very difficult game for us, something that we expected. We tried to prepare our players for the different style of basketball that Olympiacos plays, especially in its home court, but obviously, our approach was completely wrong. We were thinking about how to get into the game through offense, but not with our defensive approach, trying to stop Olympiacos. We allowed, in the beginning of the game, 32 points in the first half from low post offense and transition through our turnovers. 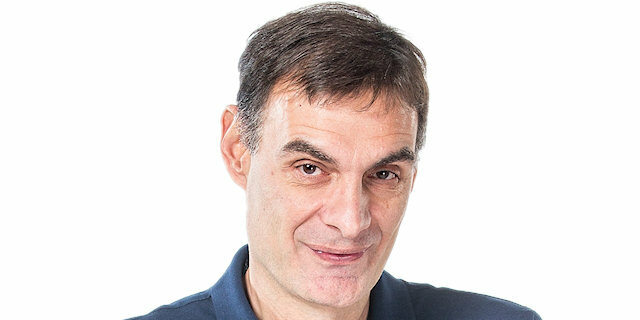 So, obviously, we should have played much, much better if we wanted to have luck in this game, but we are a completely new team and a lot of our players, all of our frontline, are newcomers in European basketball. They don't know what it means to play against Olympiacos in Piraeus and it was a great opportunity for them to have a good, strong lesson. Good luck to Olympiacos." "It feels great [to be undefeated], but we are just in the beginning and need to work hard. The season is long and we have many games until the end. We just need to be humble and go game by game, like today. I am happy; whenever my team wins, I am happy. I will always try to do what is best for the team to win games because, for me, this is the most important." “It was everything that it was supposed to be. A tough-fought battle against a veteran team with a lot of experienced guys. It was a tough fight tonight to come out on the bottom. 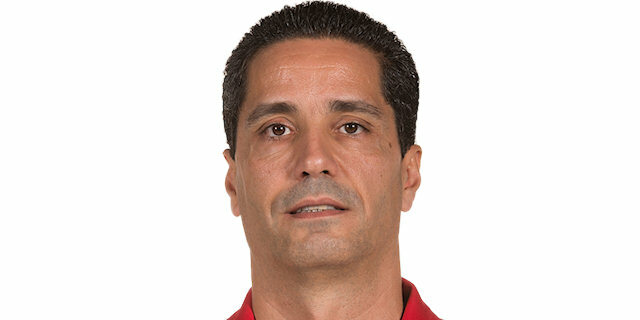 Definitely, Olympiacos’s experience played a part. We knew exactly what's gonna be coming here. It was another slow start like we have been having and tonight we've needed to fight away better. You could use experience as excuse, but we know that's not an excuse as we just want to get back, work and try to improve."